Happy December my friends. The fact that we are in the last month of the year has me dumbfounded. Where did the last three months go? I just hope time slows down for the next few weeks so we can enjoy the holiday season, and everything that we are thankful for. Speaking of, one of the little things I am thankful for is finding a bell/tiered sleeve top that doesn't get in my food every time that I eat (as I said, the little things). I have been loving the bell sleeve style, but the practicality of wearing the trend on an daily basis, being a stay at home mom, has been zero. That is, until this tiered flare sleeved sweater arrived at my doorstep. Not only is this cable knit cozy, but because the sleeves are shorter, they aren't constantly getting in my way every time that I eat, or change a diaper. 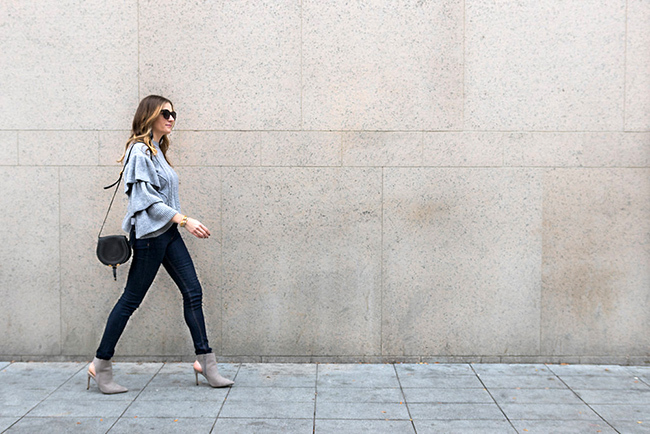 Although this sweater is not technically cropped, it is on the short side, so I paired it with high rise jeans and grey booties, for a stylish everyday look. The great thing about this sweater is that it can easily be dressed up. I'm thinking of pairing it with this skirt and heels for a fun holiday outfit. PS. Because I am always cold, I wore this sweater last weekend in Killington, Vt with a long sleeve tee under it. I love how the sleeves to my shirt stuck out, adding a fun texture. *This post contains sponsored content and affiliate links. All thoughts and opinions are my own. Thank your for supporting the brands that I love here on Threads for Thomas. The feature blogger of the week is Lee from Legallee Blonde. I love how she takes her look from the office to a holiday party. Make sure to visit her blog to say hello, and get some great office wear inspiration! I love your grey sweater! Those sleeves are so fun! Thank you for the linkup and have a great weekend! Cute sweater! 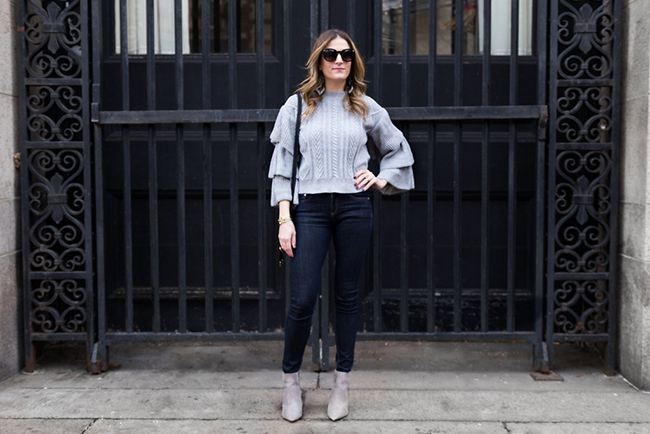 I love the sleeves & that that they are a lot more practical than a regular bell sleeve top! This sweater is beautiful and cozy looking at the same time. I love the tiered bell sleeve look in particular. I can't wait to see the skirt/sweater combo. Great look! Love your bag and shoes. I'm so in love with these structured sweaters right now! I see them as such a piece of fashion art! 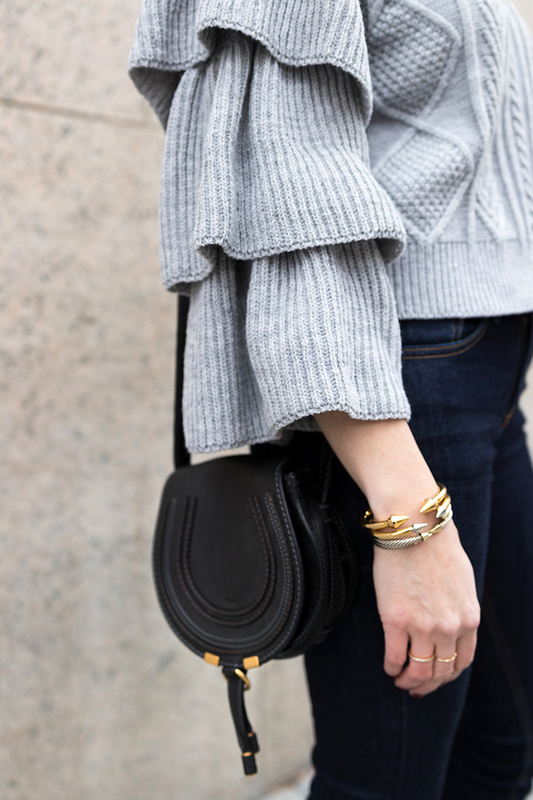 That sweater is SO fun- love a statement sleeve! this sweater is so fantastic! Amazing look! Seriously you find the coolest things!! Those sleeves are just fabulous, really really fabulous. And I like how they're not bulky despite being layer upon layer. I'm talking about how women treat women over at the blog today, and would love for you to read, and share your thoughts. So do come over, and join in my Project Sister Act Link-Up too? It's currently live until the 8th. I love that cable knit sweaters are coming back! I think they're so perfect for any body type! Such a fun sweater! It looks so warm too! Those ruffles are fab! I cant seem to find a good sweater! I like this one though! Gorgeous look, babe! I love that sweater! The sleeves are so pretty on this sweater and I am really in love with those earrings, too! The sleeves of this sweater are so pretty! loving your accessories in the pictures above!